Isolation And Madness In Cul-De-Sac (1966) – Roman Polanski. Few films are as explicit in their depiction of character relationships that are at the mercy of the fluctuating landscape than Roman Polanski’s 1966 film, Cul-De-Sac. 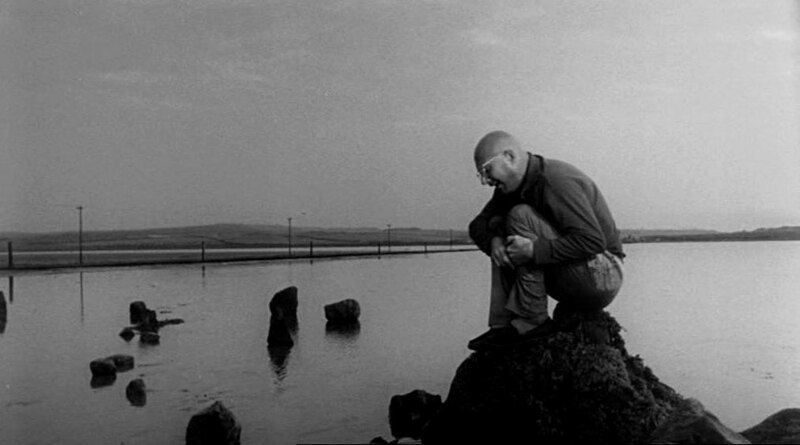 Polanski had been to both ends of the environmental spectrum within his previous two films – the open waters of Knife In The Water (1962) and the cramped, claustrophobic London of Repulsion (1965) – and Cul-De-Sac sees him returning to the ideas of the landscape delicately addressed in the former of the two films; where characters are put under huge psychological strain through being stuck in each other’s company. Whereas Knife In The Water had a more definitive human hand in the desertion from society, Cul-De-Sac raises the tension by removing all potential of escape. The characters are at the literal mercy of the tides of Lindisfarne. The film follows two criminals on the run. One is injured and their only hope of escaping capture is to invade the lives of two occupants of Lindisfarne Castle through pushing a stolen, broken-down car over the flooding coastal road to Holy Island. The drama takes a turn for the surreal when the castle’s occupants, George (Donald Pleasance) and his wife, Teresa (Françoise Dorléac), begin to break down their relationship; leaving the four in a strange emotional purgatory as they wait for the tide to go back out. In the meantime, they have to deal with the arrival of a visiting group of their bourgeois family on a boat as well as the total disintegration of communication between each other. It was said that he conversed with angels, and sometimes received food from them on his travels. Once, an angel in the form of a white robed horseman cured a painful tumour on his knee. On another occasion, when he was out in the hills without food, he was fed by an eagle, which brought him a large fish. (1977, p.509). Previous to this, the book also describes the Saint’s attitude towards women as one of “distrust.” All of these elements combined create an odd network of connections within Polanski’s film and the development of his characters. In folklore, the area of the film is one that has often helped the lone figure in times of stress, whether through food or healing. Polanski’s film unwittingly realigns the folklore so that the complete opposite occurs, creating an ironic sense of comedy. Instead, the food on the island gradually diminishes and the wounds of the injured gangster eventually kill him. The contrast between the land’s history and its treatment of the current characters is palpable. Perhaps the most interesting development is that of George, the neurotic owner of the castle. When he is introduced in the film, it is clear that he is already on the cusp of some sort of breakdown. The only aspect that the modern-day inhabitants share with the previous Saint is their joint mistrust of women, specifically in the case of Teresa who not only is implied to be having an affair with one of George’s friends but also eventually provides George with the weapon and urging for him to kill Richard the gangster (Lionel Sander). Teresa’s name also implies some saintly function but is polar to that of the castle’s previous inhabitant; the landscape clearly affects different people in different moralistic ways. Before the castle was first built in the 11th century, the island was said to have been “…sacked by Danish raiders in AD 875, an event which was said to be preceded by storms and fiery serpents flying through the sky.” (1977, p.349). Aptly, George seems to go through his own siege, physically and mentally. The natural barriers of his home work against him as he and his wife become trapped with unwelcome guests of both the dangerous and the frustrating kind (a theme that Polanski would further explore variously in Rosemary’s Baby (1968) and The Tenant (1976)). After the drama has peaked and George has been driven to the murder of the surviving gangster, he himself falls to the siege and is left broken down in the foetal position, sitting on a rock within the vast surroundings of the landscape. The act of the gangsters arriving could easily be read as being akin to the storms of the folklore and the final transition from neurotic eccentric to psychotic murderer could be likened to the Danish plundering alas without any conceivable winner. The final destination of George’s psychological state finds little solace in the landscape that has effectively worsened his situation. With the brief presence of the invading family, it is clear that George wanted to get away and to isolate himself and his wife in the hope of curbing both the sociological necessities forced upon him in family life and the gradual decomposition of the couple’s affection for each other. Both have been heightened by the intrusion of the gangsters, cramping up their chosen isolation and forcing it down the only road left open to the group marooned by the tides and waters; that of madness. Uncanny Portals And Standing Stones (Children Of The Stones and Barbara Hepworth)- Part 1. Mirrors, Donald Cammell and Jorge Luis Borges.